surface. The crust is thinnest beneath the oceans (5-12 km) and thickest beneath mountains (up to 70 km). alloyed with sulphur and oxygen with some nickel. than the form we are more familiar with. 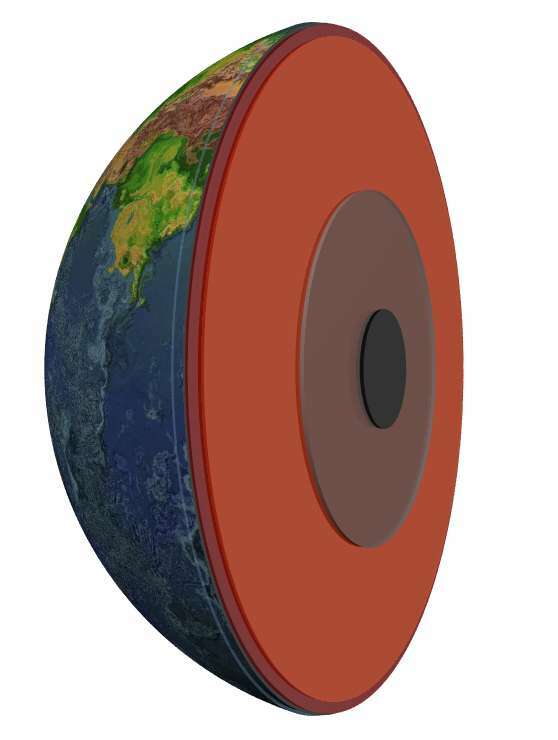 Why is the Earth layered (differentiated)? as the silicates that make up most of the crust, floated on top of the melt and eventually cooled and solidified. is the natural radioactivity of the Earth's rocks. The radiation produced gets largely converted into heat. How do we know what the Earth is like inside? examined more closely and the theory refined. reasonable, since we know that magnetic fields arise when positive or negative electric charges are in motion. contain positive and negative charges and so the flow of a liquid metal is expected to generate a magnetic field. Earth stretches out into space as the magnetosphere. the ground, the magnetic field makes your compass needle point to magnetic North. human engineers discovered the same principle and used it to generate electricity in power plants. share it with you here.